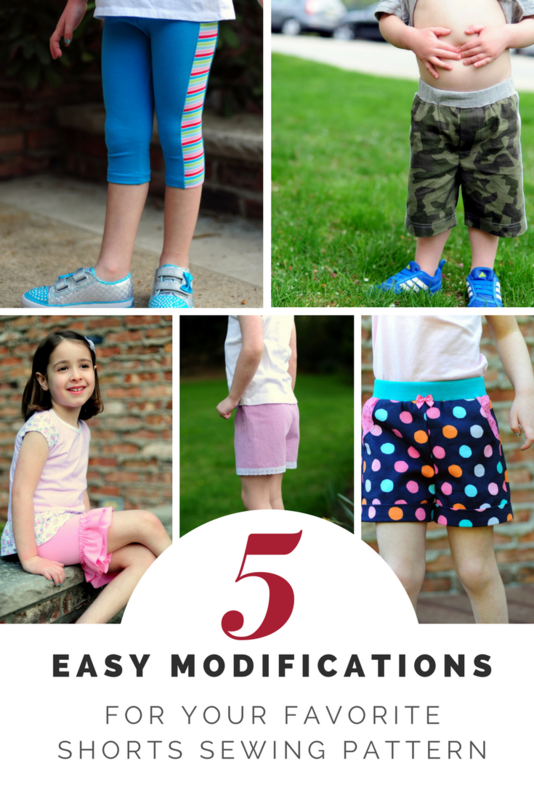 5 Easy Mods for Your Favorite Shorts Patterns - Peek-a-Boo Pages - Patterns, Fabric & More! Last month I posted about some of my favorite ways to embellish blank tees and tanks for summer. 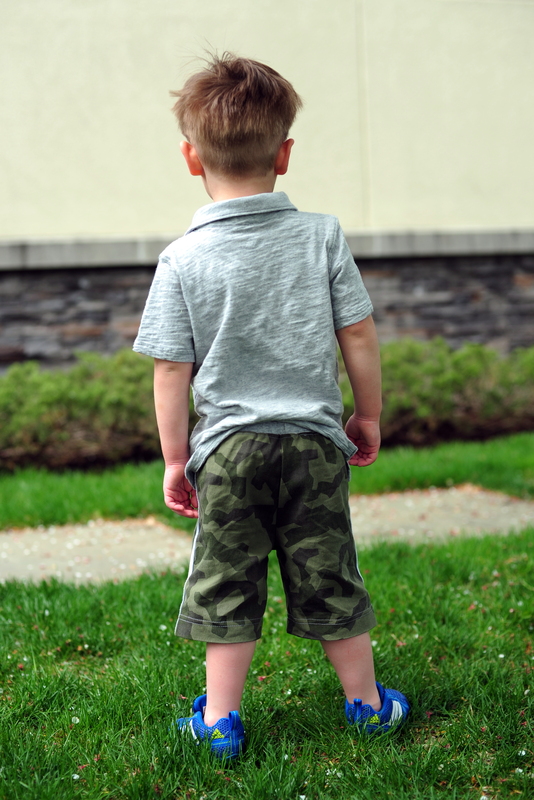 Today I’m going to share a few of the modifications I like to use to modify shorts sewing patterns, too – then you’ll be all set to mix and match a fun summer wardrobe for the kids in your life. I’ve used a variety of Peekaboo Patterns for the versions I’m showing here, but if you’ve got a different pattern that you know fits your child well, these would be easy to adapt and use elsewhere. Let’s get started! 1. Knit waistband – who doesn’t love a comfy elastic waistband encased in knit?? Several of Amy’s patterns feature knit and elastic waists already, so it’s easy to mix and match with a pattern that doesn’t. 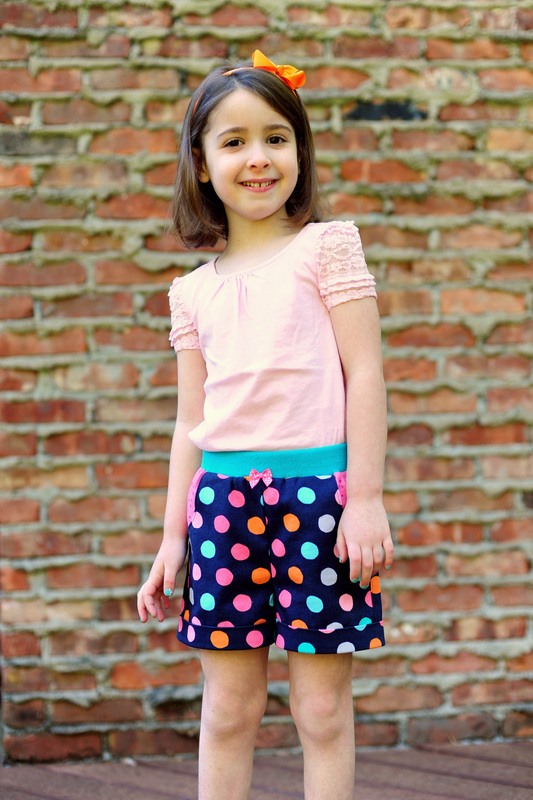 For these polka dot shorts, I actually used the Seaside Scallop Shorts pattern (minus the scallops, more on that in a sec). That pattern is drafted with an attached flat front waistband, but I wanted to switch things up. I used a strip of rib knit that was 3.5″ tall by about 20″ long. 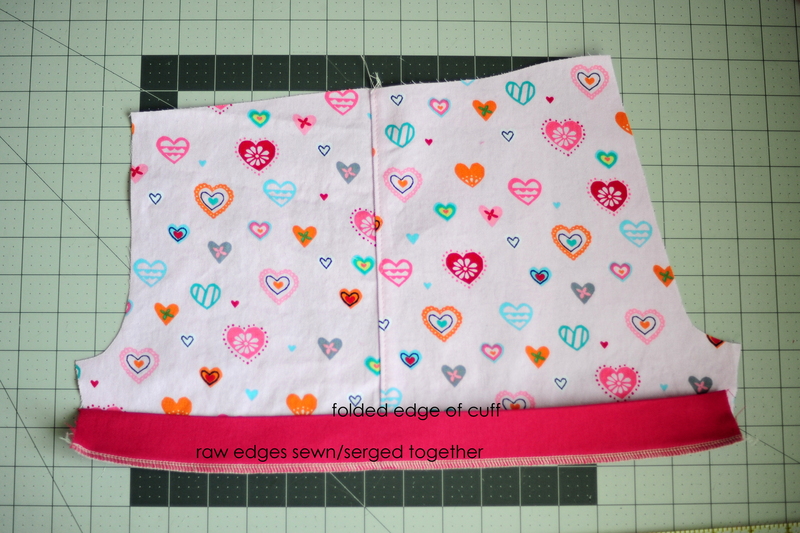 I wanted the waistband to lay nice and flat so I didn’t want my strip to be much longer than my elastic. 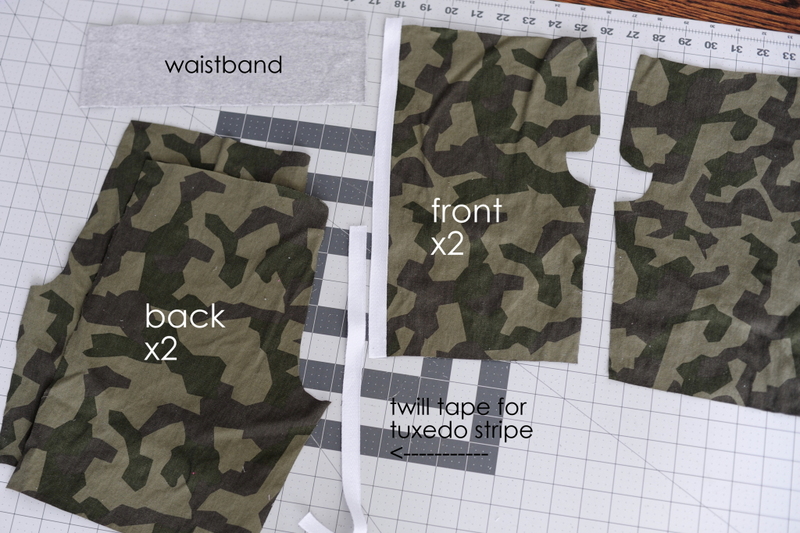 (Just make sure that your waistband fabric will stretch enough to fit the shorts and you’ll be good to go.) To attach the waistband, I sewed the shorts sides RST to make a loop, and pressed the strip in half along the long side. I sewed my elastic (I used 1.25″ elastic here) into a loop and sandwiched it into the ribbing. I stretched it to fit the waistband of the shorts, and sewed them together with right sides facing. Press the seam down toward the shorts and topstitch if desired (I didn’t topstitch here). Instant comfy shorts! I mentioned above that I used the Seaside Scallop shorts for these, but omitted the scallops. For that, all I did was draw a straight line across the bottom of my pattern piece, right along the lowest point of the scallops. Instant straight hem! You can just hem as is (make sure to adjust your inseam length so they don’t end up too short once you’ve hemmed, though) but for this pair I wanted to add cuffs. 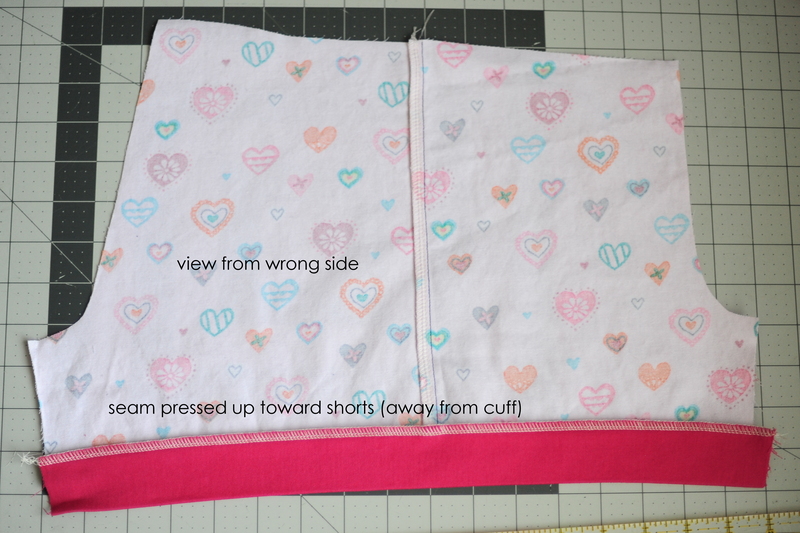 To do that, I began to assemble the shorts and sewed the fronts to backs at the side seams. Now I have a left leg and a right leg, laying flat. Want to skip the pockets? 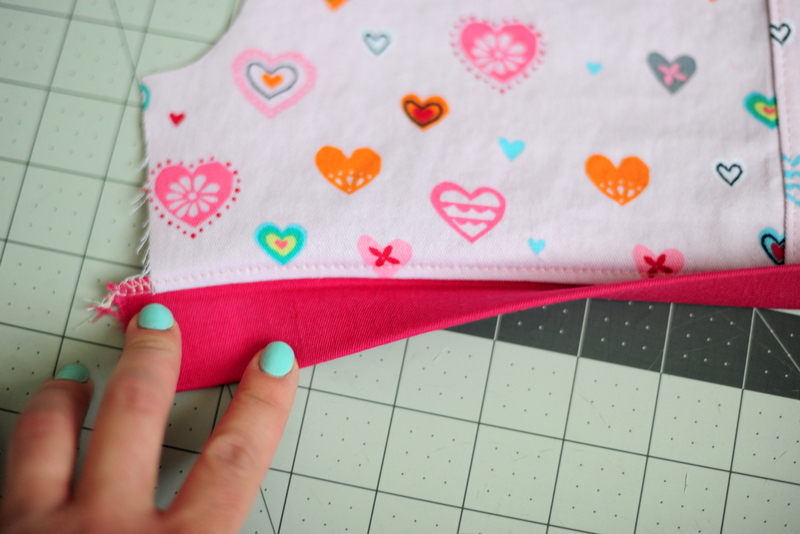 Just lay the pocket piece until it lines up with the front pattern piece – like the missing puzzle piece! 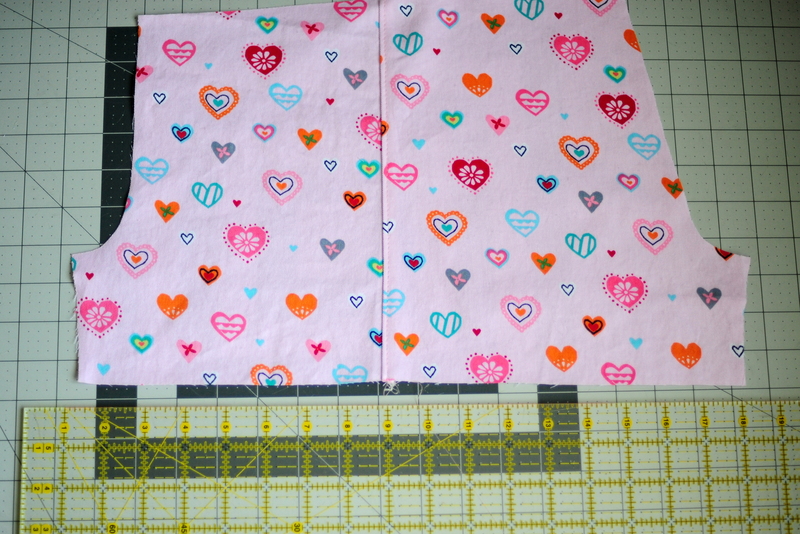 Cut front piece as one and proceed with pattern. I measured along the bottom of the leg and cut a strip that was 3.5″ tall x the width of the leg. I pressed that strip in half along the long edge, and aligned the raw edges with the raw edge of the shorts leg. I sewed them together, finished my seam allowances, and pressed them up toward the leg of the shorts. I topstitched that seam on the right side, but here it’s also serving as a sort of understitching since it will help hold the cuffs in place when I fold them up. Press the cuffs up toward the shorts right along the edge, and tack with a few stitches at the side seam. I sewed the inseams together next, taking care to align the edges of the cuffs. You can attach cuffs separately, but I’ve found that my daughter prefers when I enclose them into the inseam – I think because they lay a little flatter that way. Next I put one leg into the other with RST, and sewed the U-shaped curve for the front and back rise. Make sure to finish those seam allowances since woven fabrics will fray in the wash. I attached the waistband last (as described earlier) and Miss P’s new shorts were ready to go! This is probably the easiest mod ever, but still super cute. I picked up some 1″ twill tape from Pick Your Plum awhile ago, and it’s been begging to be used. 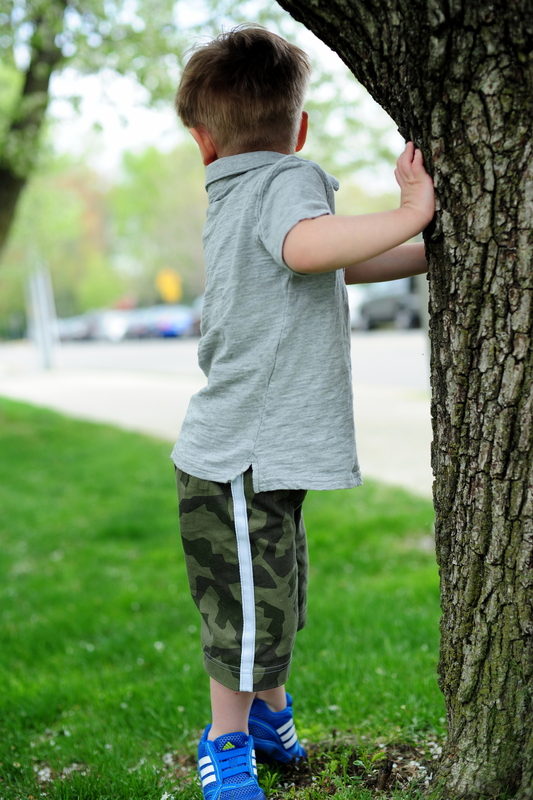 I used the Castaway Cargoes for my little guy (using a pair of camo-ish twill pants that I picked up from the juniors’ clearance rack for $2 at Kmart), and omitted the pockets for quick sewing. I sewed up the side seams and pressed the seams to the back before attaching the twill tape. 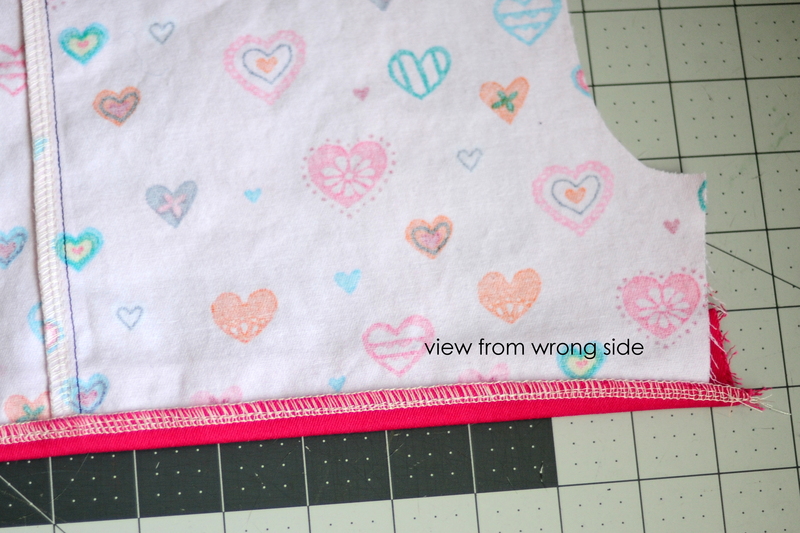 I like to use Washaway Wonder Tape to hold it in place, centering the twill tape right along the side seam. 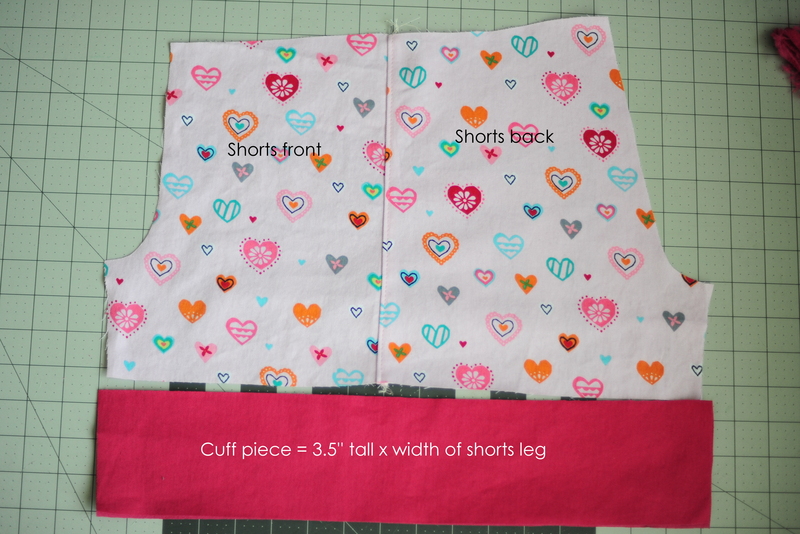 I stitched the tape in place along both sides, and then sewed up the shorts as instructed in the pattern. See, told you this one was easy! 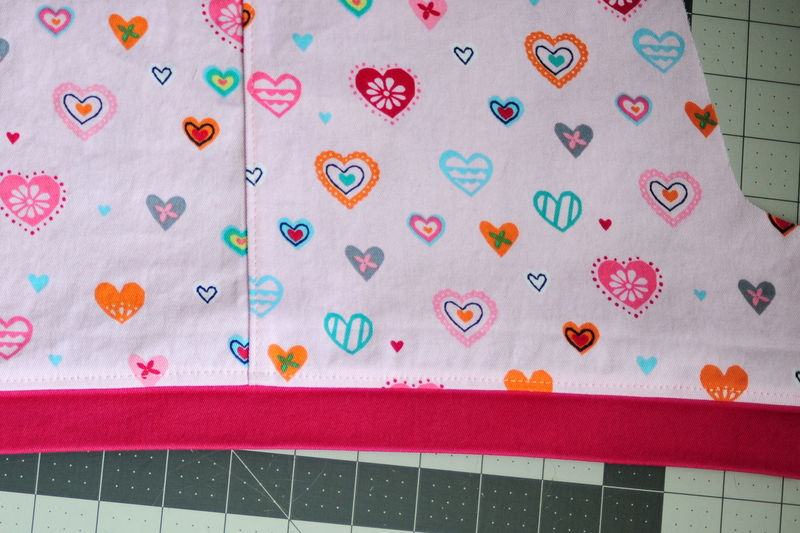 This mod is a little more involved than the tuxedo stripe since it’s sewn INTO the other pattern pieces, not ONTO them – but it’s still super easy and pretty quick, too. I used the Lollipop Leggings for this, and folded my pattern piece in half right down the side of the leg. 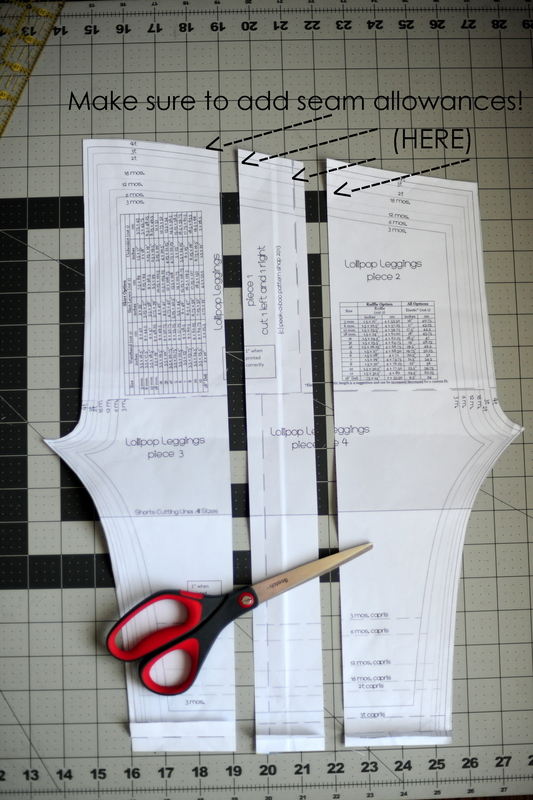 I wanted my stripe to be 2″ wide, so I cut a strip out of my pattern piece that was 2″ wide. You’ll need to make sure to add seam allowance to the two sides of the stripe (so I cut my contrast stripe at 2.5″ wide, giving me a 1/4″ SA on each long side of the stripe) and also on the cut edges of the original pattern piece. I sewed my stripe to the front and back pieces, and pressed the seams out. I topstitched mine so they’d lay flatter along P’s legs (fewer complaints that way) but you don’t need to topstitch unless you want to. 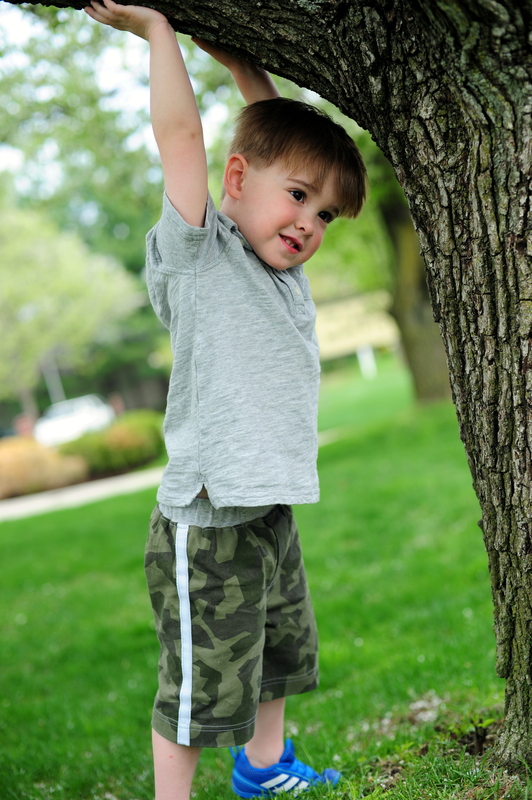 Once you have two new “legs” assembled, sew as directed by the pattern to complete your shorts/capris/pants. I’m a tshirts-and-jeans-gal who birthed a ruffles-and-fluff child. In her eyes, everything looks better with a little ruffle. 😉 She’s a good sport who puts up with just about everything I ask her to wear, so I do try to indulge her love of all things girly. 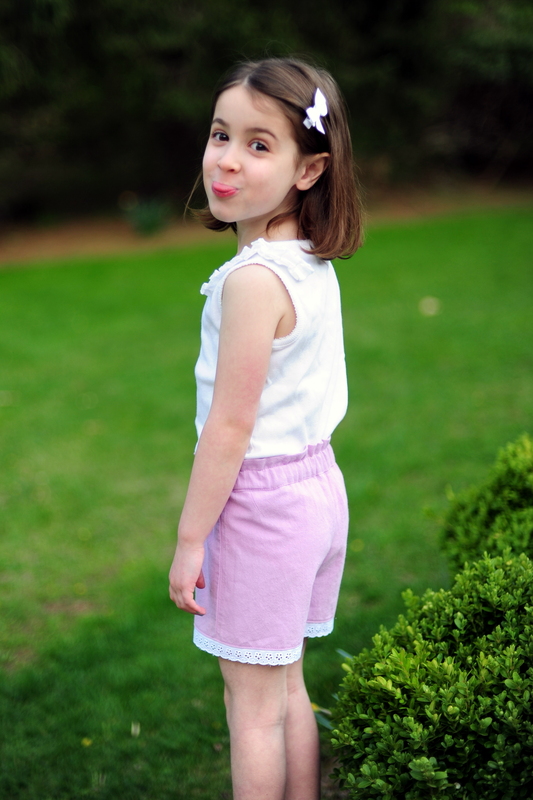 (That’s why this pair of shorts is not only ruffly, but also cotton candy pink. Go big or go home, right?!) 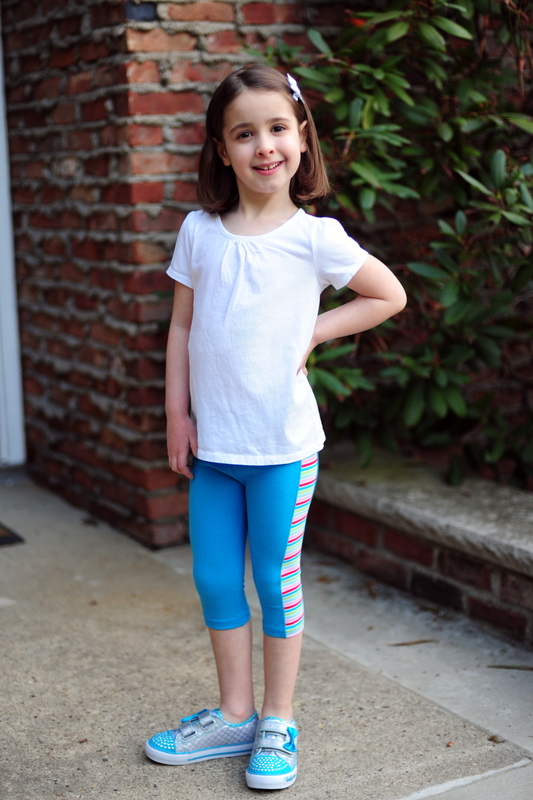 I used the Lollipop Leggings for this one also, and cut it along the line for shorts length. I cut two strips of my knit for each leg (so four strips total), and I cut them 3″ tall by double the width of the pant leg (measured at the hem). This makes for a pretty full ruffle, so you can always do 1.5x or 1.75x the width if you want them a little less full and fluffy. For the hem ruffle, I just gathered it up to match the raw edge of the shorts leg, and sewed the ruffle to the leg RST. I pressed the seam up, and then marked a line (I love the Frixion pens for this, since they’ll disappear once you press with your iron) one inch above the seam line. I took my second ruffle and aligned the top edge of my ruffle strip with the marked line on the shorts. 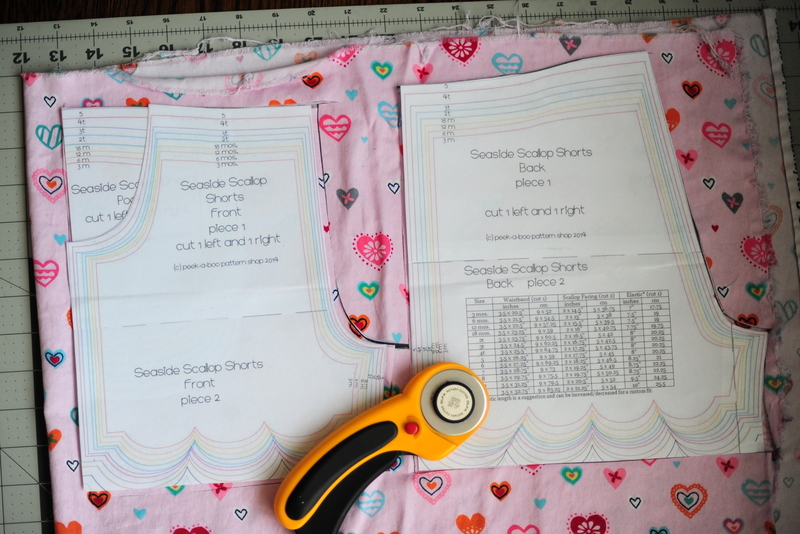 I used a smallish zig zag to attach the ruffle – you’ll want to make sure to use a stitch that stretches since these shorts will be fitted and will stretch around the wearer’s thighs. My zig zag was about 3.5 x 3.5mm. 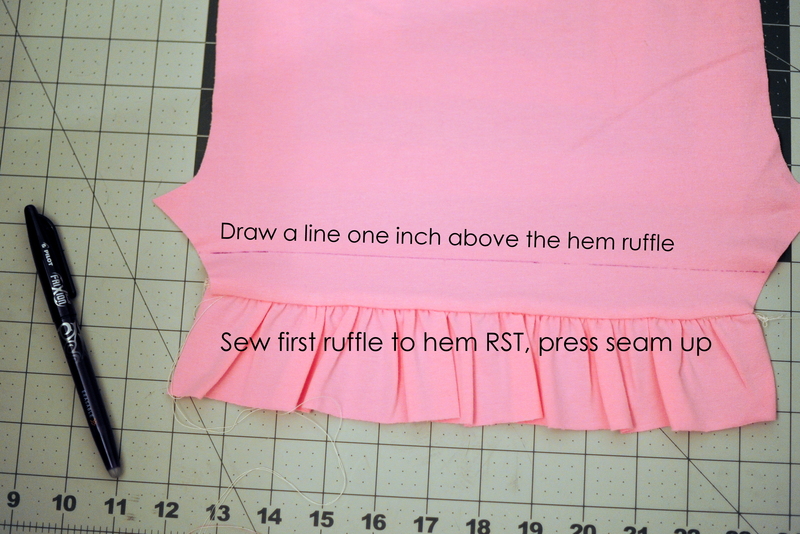 Make sure to use a thread that matches your ruffle so your stitching won’t be too visible. 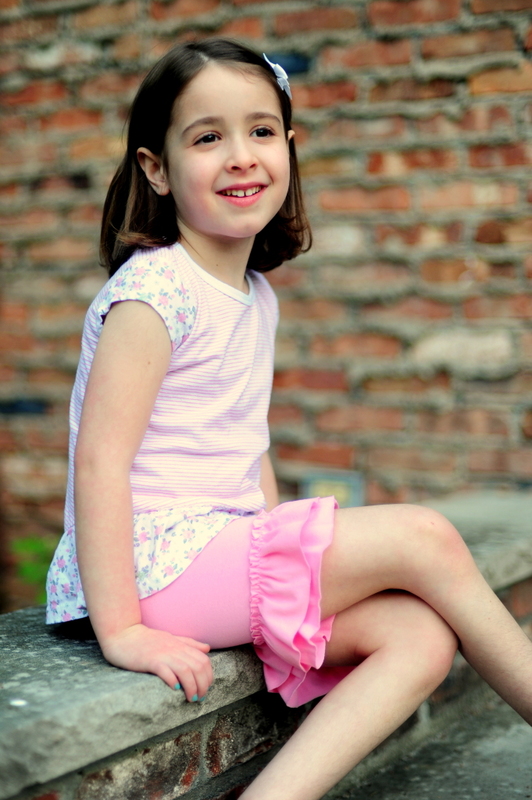 I removed the gathering stitches once the ruffle was attached, and then sewed the shorts as instructed by the pattern. 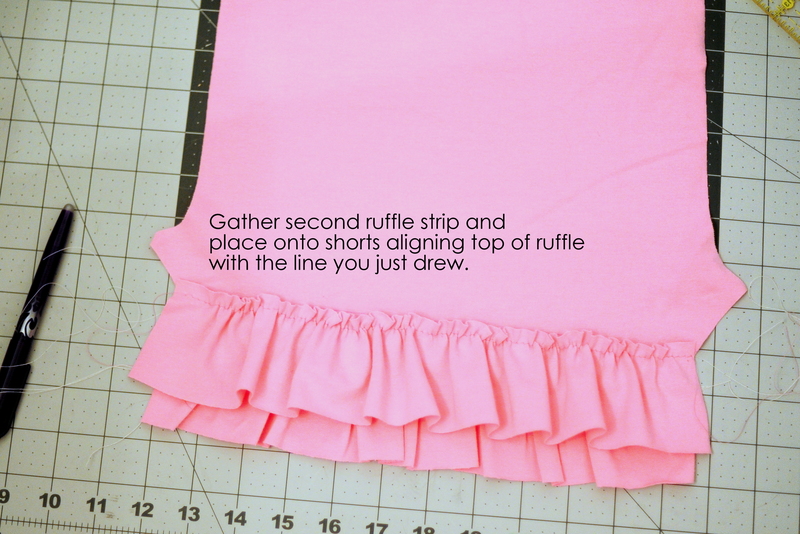 Make sure to take care to line up the ruffles when you sew along the inseams. I like to leave the last 1/2″ or so of each ruffle strip unruffled, so it will be easier to sew the inseams later. 5b. And one last super simple little mod – so simple it doesn’t even get it’s own number on the list. Just add trim! 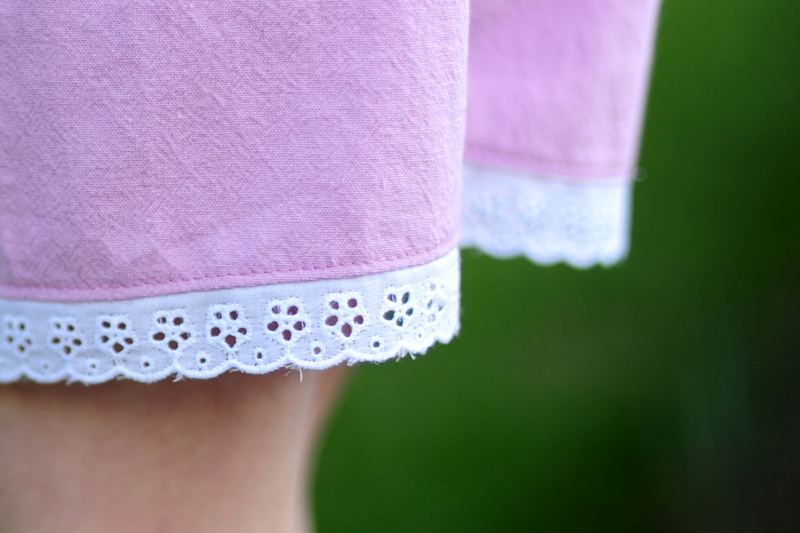 I used my straight-hem Seaside Scallops for these, and just added a sweet eyelet trim to the hemline. I sewed the trim to the shorts leg (laying flat) with raw edges aligned and right sides facing. I finished the seam allowance with my serger, pressed the SA up toward the shorts leg, and topstitched to hold the seam in place. Sewed up the legs and completed the shorts as directed in the pattern. See, the easiest! What are you waiting for??! 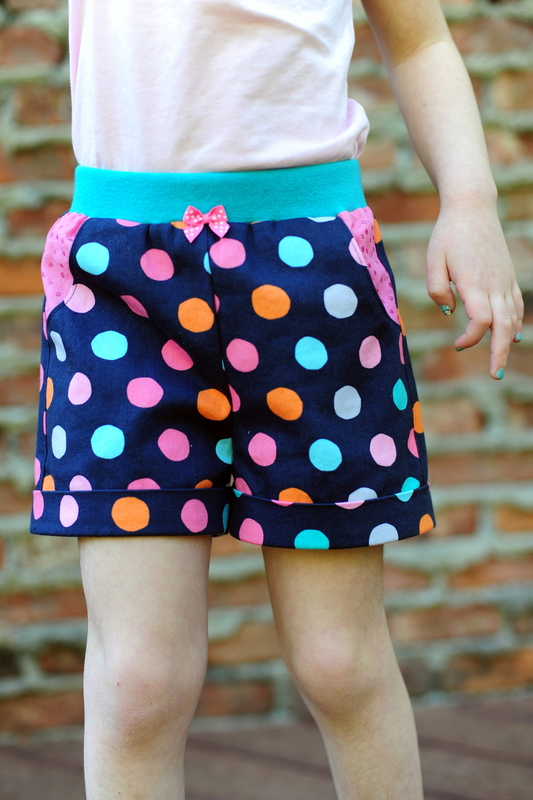 You can modify shorts patterns and make sure to join us in the PAB Facebook group to share what you’ve been working on! Previous Post: « Double Trouble Reversible Hoodie Pattern is here!